You have decided to participate in a trade show and are trying to cook up strategies for the perfect booth. You want something that enhances your presence at a crowded event and persuades the audience to stop by and learn more about your products and services. That is one of the more essential purposes of a trade show booth after all. While weighing different options that will help you achieve your objectives, you should definitely consider investing in an island booth. Island booths are a type of exhibit that is open on all four sides. Unlike other exhibits such as inline or perimeter, which only allow you to interact with customers walking directly in front of you, island booths give you access to customers in every direction. 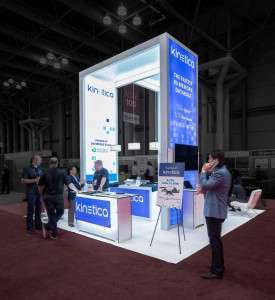 They are usually the largest of all booths at any trade show, making it easy for them to catch the attention of visitors. Whether you are a small business exhibiting for the first time or a large business with a great deal of experience at trade shows, purchasing an island booth for a single event demands a substantial amount of investment. When you decide to go for an island booth rental, the renting company is usually equipped with the capacity and resources to design the booth for you. They offer a vast inventory of choices for structures, materials, graphics, fabrics, and furniture. While purchasing dictates that you sit and create everything from layout to flooring all by yourself, renting frees you from that responsibility by relying on more competent and experienced minds to create a booth that will capture the essence of your brand. An island booth rental is a cost-effective way of using a large and impressive display at a wide variety of budgets. For a fraction of the purchasing cost, you can make your brand look like a force to be reckoned with at any trade show. Additionally, the money you save on renting can be reallocated to designing the booth in ways that convince customers to spend time there. For instance, you can create private spaces to interact with interested attendees or set up lounging stations where people can stop and rest for a while. Besides, purchasing will ask you to shell out ownership costs for maintenance and repair of the trade show exhibit, which, unless you exhibit several times a year, can be a huge waste of space and budget. Purchasing an island booth limits the possibilities of designing. You’ll be stuck with the same layout and elements at every trade show, which can get pretty boring for both you and your customers. A booth rental will let you mix things up by offering a range of customizable options to choose from. This way, you can give yourself a fresh and unique look to match your objectives at every show. For example, if your goal is to introduce a new product in the market, you can hang banners or long-range graphics to increase your visibility. As trade show experts, we know exactly how much work goes into making trade show a success. That is why we are here – to make sure none of that hard work goes to waste. If you decide to make us your booth partner, we will offer you a wide variety of pre-designed, customizable booths that are suitable for every budget and location. Once you share your trade show booth ideas and let us know what you want to achieve by the end of the show, we will assign a dedicated project manager who will make sure all your demands are met, leaving no room for discontentment. Furthermore, our designers are trained experts who will carefully compose each element of the booth in a way that makes them both visually-appealing and functional for day-to-day use. At the end of the designing and building process, we will invite you to pre-test your booth rental so that you can see your trade show booth design brought to life before the show begins. In case you are unhappy with any aspect and want us to make changes, we will get it done right away. After all, your trade show experience should be as perfect as possible. And when the show is over, we will be there to dismantle the booth as well. So, if you are searching for ways to make a grand impact at your next trade show, don’t hesitate to give us a ring!